I’m not gonna lie, I grew up eating cranberry gel from a can and I liked it. 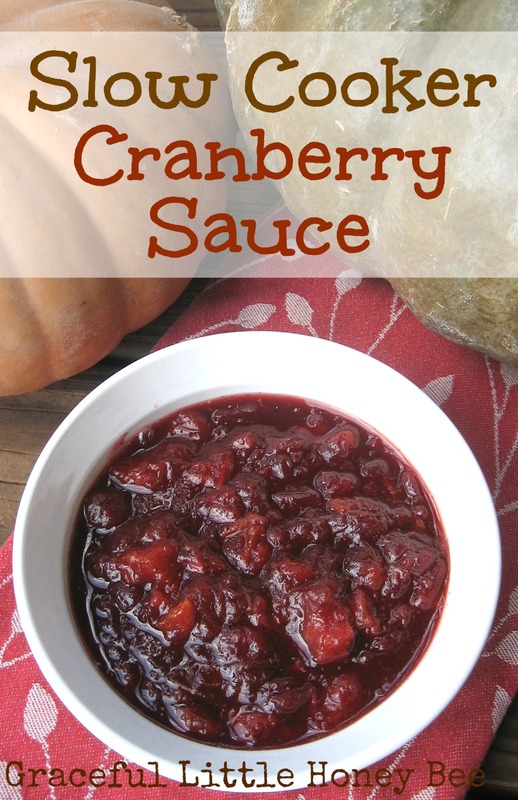 However, I had a coupon for fresh cranberries so I decided to try a slow cooker cranberry sauce recipe and it turned out great! Since it cooks in 4 hours it would be perfect to put together on Thanksgiving morning to let cook while you tend to other things. Step 1: Mix sugar, water and cinnamon in slow cooker. Step 2: Rinse cranberries and add to slow cooker with apple. Stir. Step 3: Cook on high for 3 hours. Step 4: Remove lid and mash berries. Cook on high for another 30-45 minutes or until desired thickness is obtained. Mix sugar, water and cinnamon in slow cooker. Rinse cranberries and add to slow cooker with apple. Stir. Remove lid and mash berries. Cook on high for another 30-45 minutes or until desired thickness is obtained. Has anyone tried subbing honey or maple syrup or something in place of the brown sugar? Just wondering how it might come out. I haven't tried that, but I bet it would turn out fine. Hi, how many does this serve ? It should serve around 8-10 small portions. There's a lady at our church that makes this. She adds a jalapeno or two, and then serves it on Cream Cheese to go with crackers. It is addicting, so good. Love the simplicity and old fashioned goodness of your recipes. Just wanted to mention, you might want to clarify that after mashing the berries the lid remains off the crockpot in order for the sauce to thicken. (Unless I've misunderstood) Thank you for sharing!